Jane and Cathy, two young nurses from London, are taking a cycling holiday in France. They stop at a cafe, and Cathy spots a dishy young man wearing sunglasses at another table. After continuing with their journey, they encounter the man again, riding by on his moped. Later on they have an argument. Cathy wants to stop and sunbathe for a while, but Jane wants to push on. Eventually, Jane decides to carry on alone. Jane stops at another cafe and discovers that the area they are in has a very bad reputation. She decides to go back and find Cathy after regretting her decision to carry on. She is unable to find her and believes that she has been attacked by the man on the moped. Increasingly concerned by her missing friend and apprehensive about the man on the moped, Jane decides to look for the local police officer. 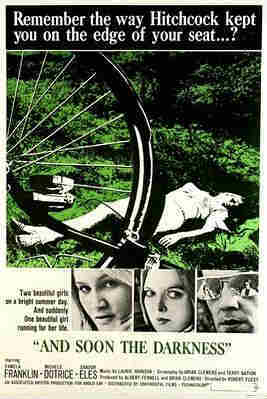 Jane is convined that Paul, the man on the moped and who claims to be a plain-clothes detective, is Cathy's attacker. Escaping from him - and then finding Cathy's dead body - she encounters the policeman, who she saw earlier. It is then revealed that the policeman is in fact Cathy's murderer. He attacks Jane, but is stopped by Paul, who knocks him unconscious. TimeOut: Unappealing women-in-peril thriller. Predicable and implausible. BlackHoleReviews: Tense thriller from the production crew of The Avengers. SpookyIsles: Beautiful cinematography and some beautiful tracking shots across the French countryside. From Trailer: A little ride in France with a killer stalking you. An American remake was released in 2010.